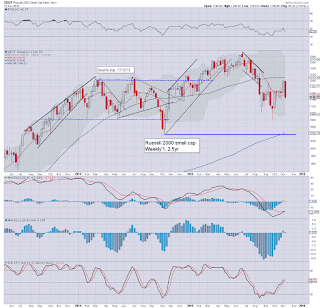 US equity indexes saw very significant net weekly declines, ranging from -4.4% (R2K), -3.6% (sp'500), to -2.8% (Trans). 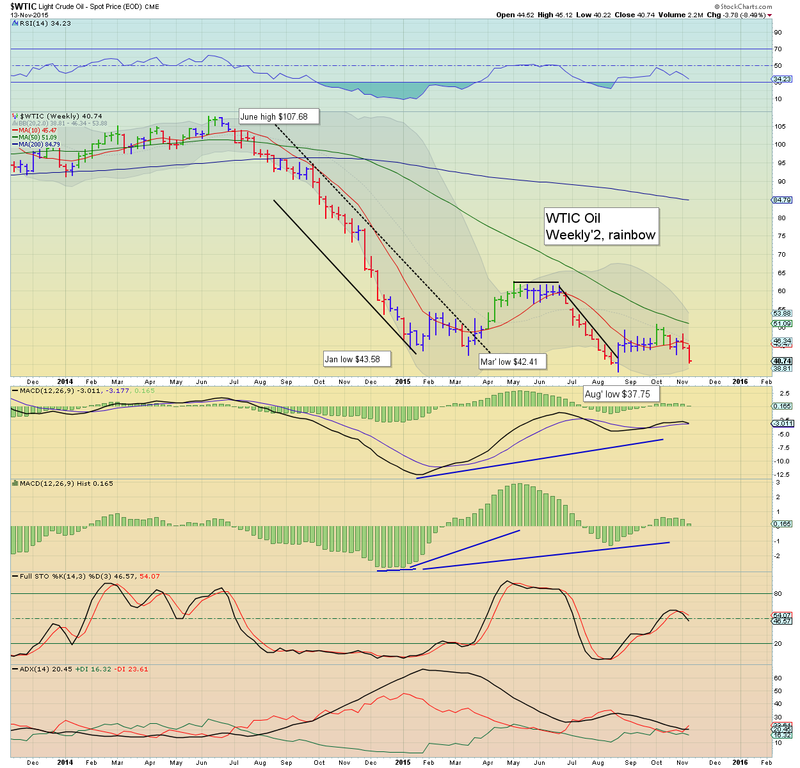 Near term outlook threatens a few more days of weakness, before battling upward into the next FOMC of Dec'16th. 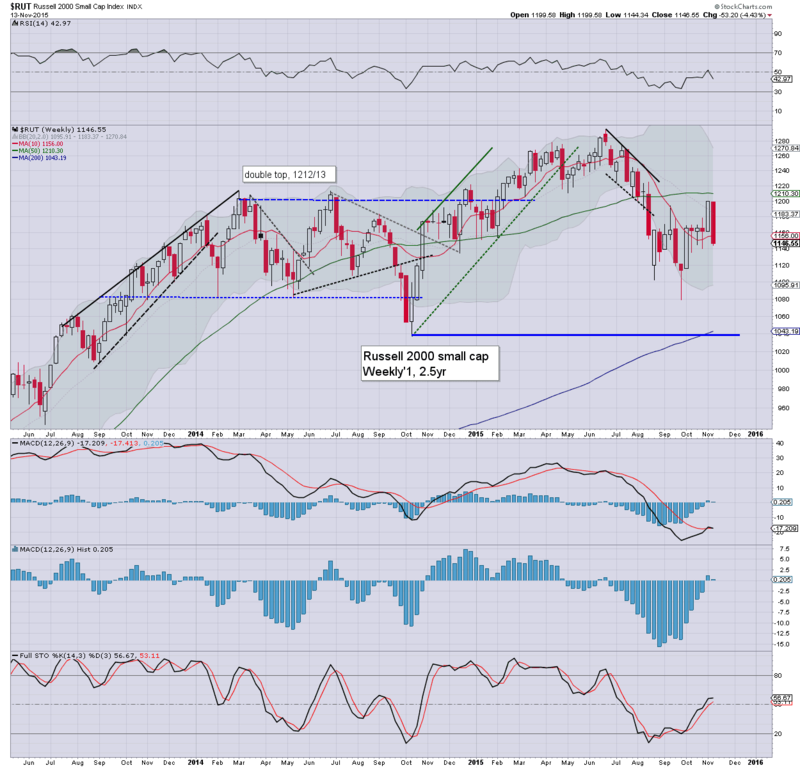 Broadly, the equity bull maniacs have little to fear unless a sustained break <sp'2000. 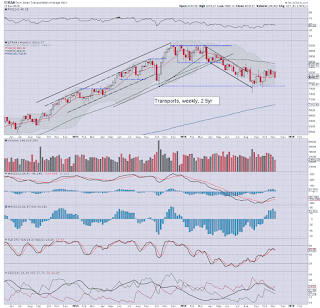 A powerful net weekly decline of -76pts (3.6%), settling at 2023, around the 38% fib retrace of the 1871-2116 wave. Underlying MACD (blue bar histogram) is starting to tick lower. At the current rate, a bearish cross is not likely for at least another week. Best guess: renewed upside to the Dec' FOMC.. at which point the sp' could be trading in the 2120/30s. What will be critical... the action of the Fed. If rates are raised... will it inspire confidence in the market? On the flip side.. if no rate rise... an initial 'relief' break to new historic highs in the 2140/70 zone... would ironically be a problem for the equity bull maniacs. Any further delay in raising int' rates will increase uncertainty across world capital markets, which could easily lead to another very significant wave lower into early 2016. 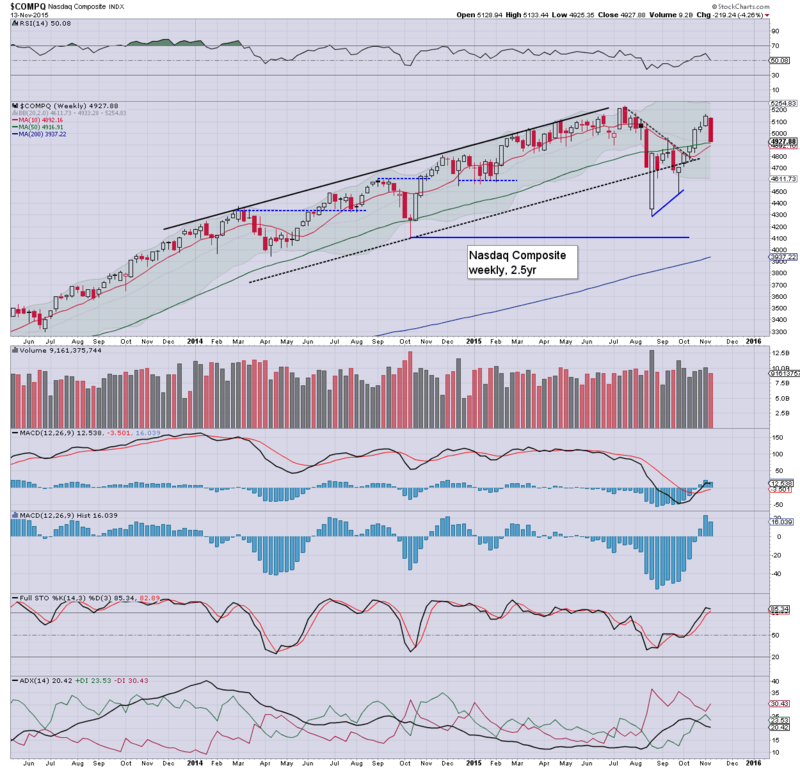 The tech' saw a net weekly decline of -4.3%, closing back under the 5K threshold. 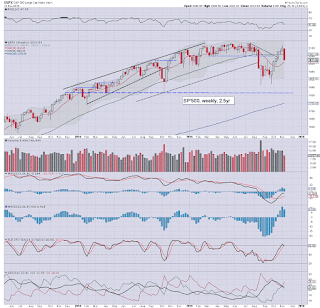 Equity bulls need to quickly re-take the 5K threshold, and break new historic highs (>5231) before year end. The mighty Dow declined by -665pts (3.7%) to 17245. 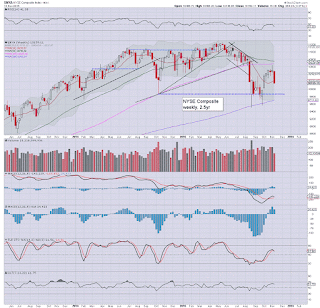 The 17K threshold remains important, with the 10MA @ 17037. 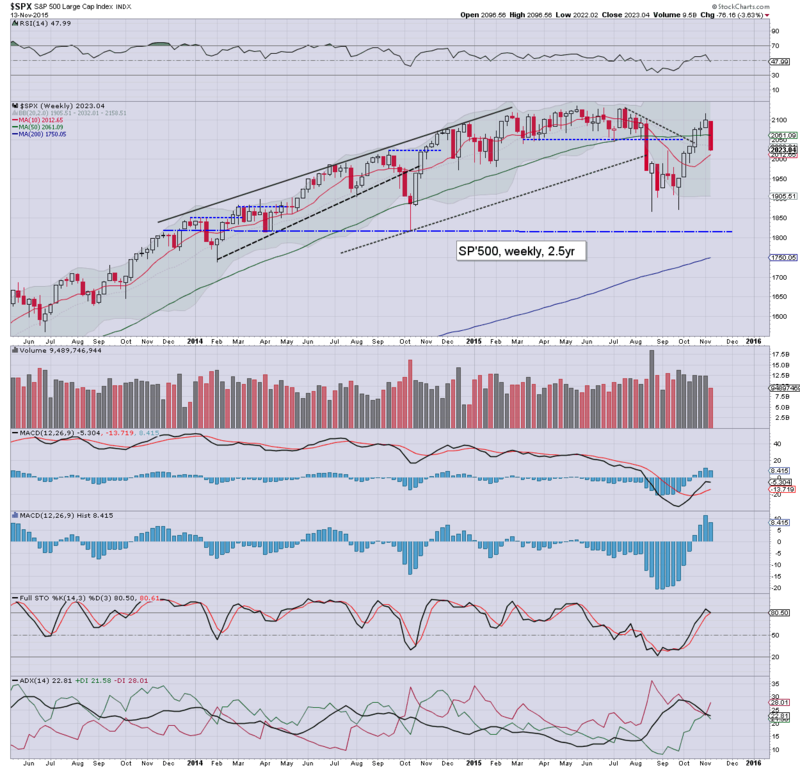 A weekly close <17K would be a real problem for the bull maniacs, but that looks unlikely in the near term. 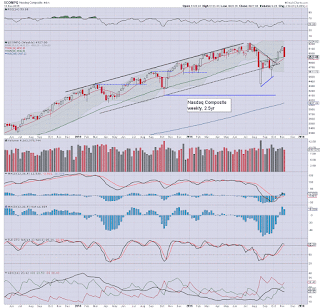 Best guess... resumed upside into mid Dec'... first target is the 18K threshold, and then the May high of 18351. The master index declined by -3.4% to 10155. The giant 10K threshold is key.. where there also happens to be a clear price gap. Sustained action <10K looks unlikely in the near term. In terms of upside... first target will be the 10800/11000 zone. 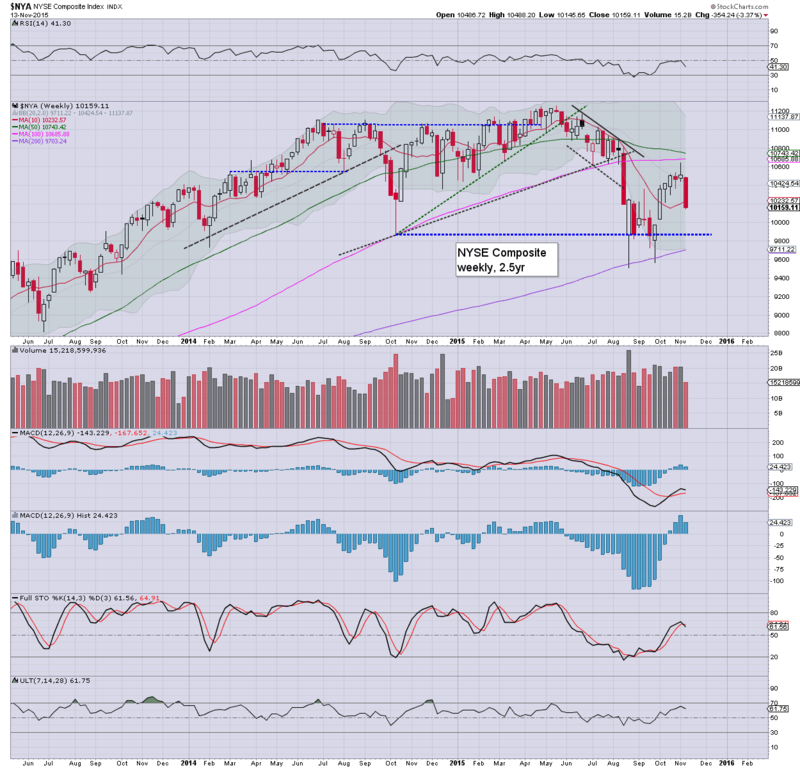 The second market leader - R2K, lead the way lower this week, -4.4% @ 1146, completely reversing last weeks gains. 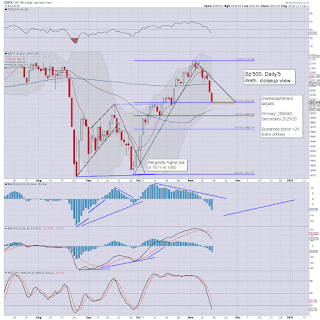 Despite the weekly loss, the underlying MACD cycle remains fractionally positive. In terms of upside, next level is around 1220. 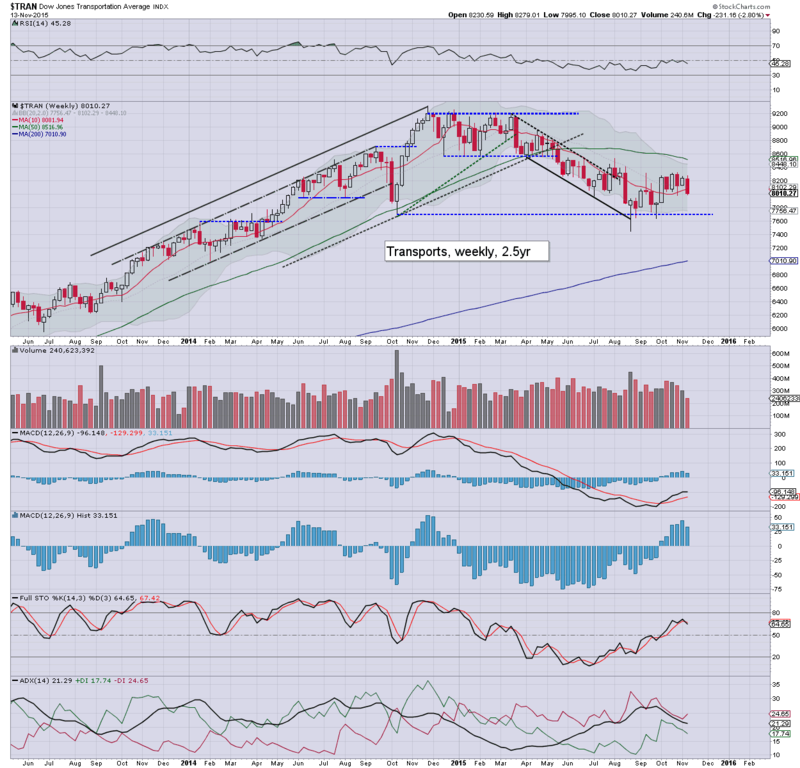 The 'old leader' - Transports, saw a decline of -2.8%, setting @ 8010. 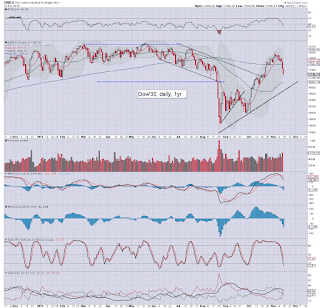 Price structure in the Trans looks tired, as the 200dma was not able to be surpassed (unlike the Dow, sp'500). If the broader market can rally into the next FOMC, best upside target remains the 8400/500s.. where the 200dma is lurking. So, six weeks up.. from a marginally higher low of sp'1871, all the way to 2116, a rather monstrous hyper-ramp of 245pts (13.5%) across just 26 trading days. 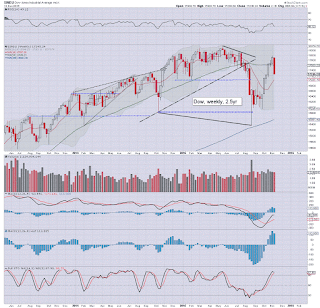 Understandably, with a rather significant net weekly decline across all the indexes some are getting seriously bearish again. 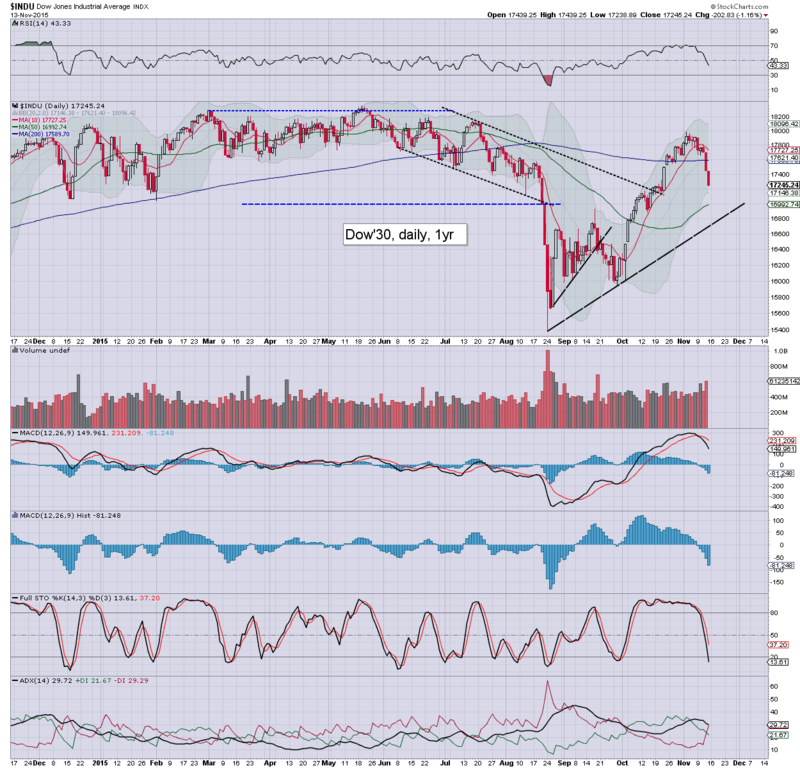 Yet, the Oct' close was very decisive, and threatens renewed upside into December. 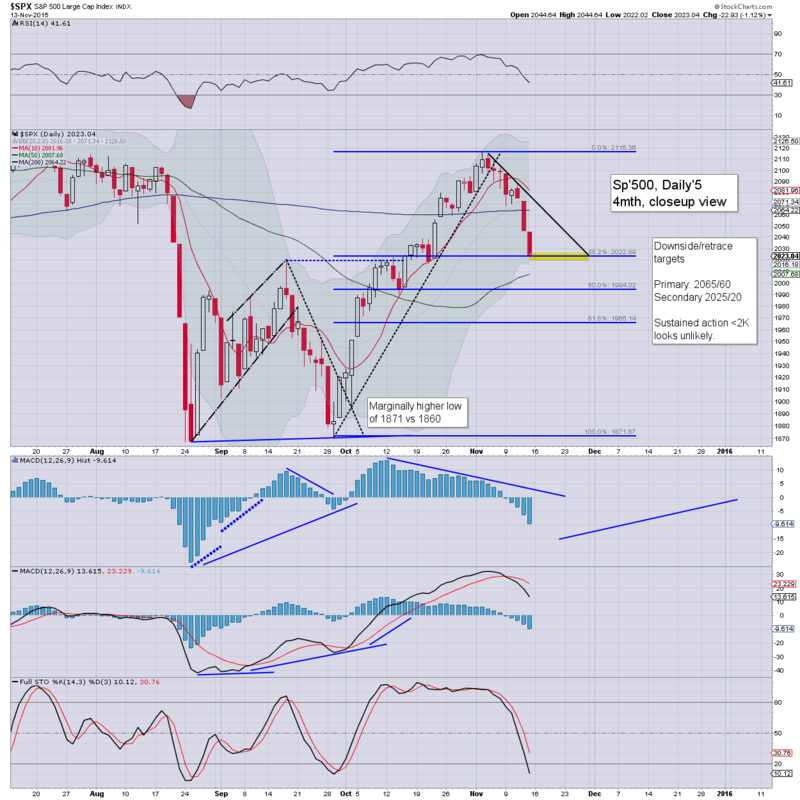 Best guess... market is close/has floored, upside to test the 2110/30 zone by the next FOMC of Dec'17th. *notable appearances from Fed officials Dudley (Wednesday) and Bullard (Friday). 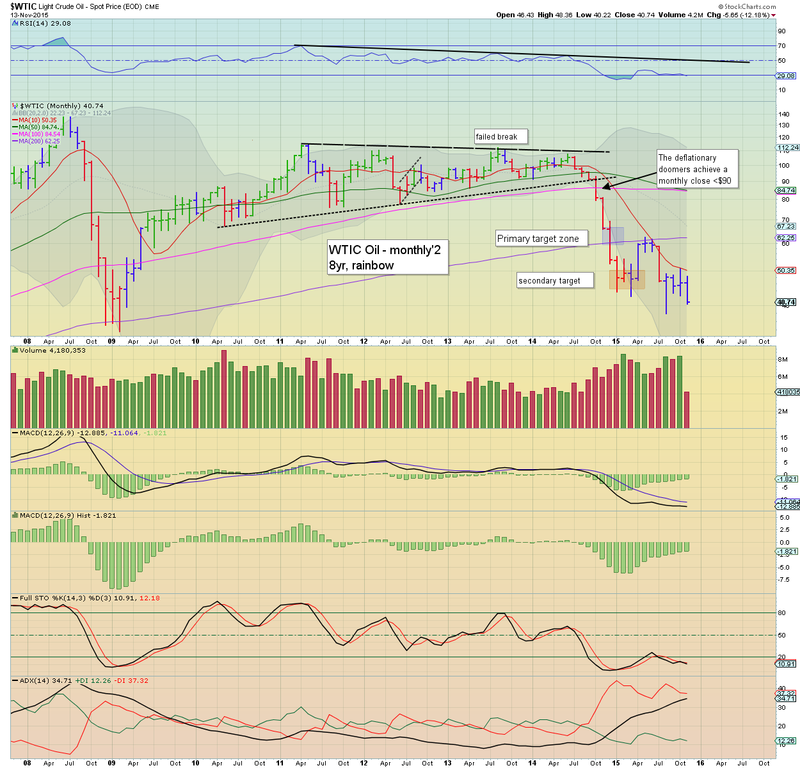 Whilst US equity indexes saw very sig' net weekly declines, it was a similarly bearish week for WTIC Oil, with a severe net weekly decline of -$3.78 (8.5%) @ $40.74. Regardless of whether the $40 threshold is lost in the near term, the underlying issue of over-supply has not been remotely resolved. 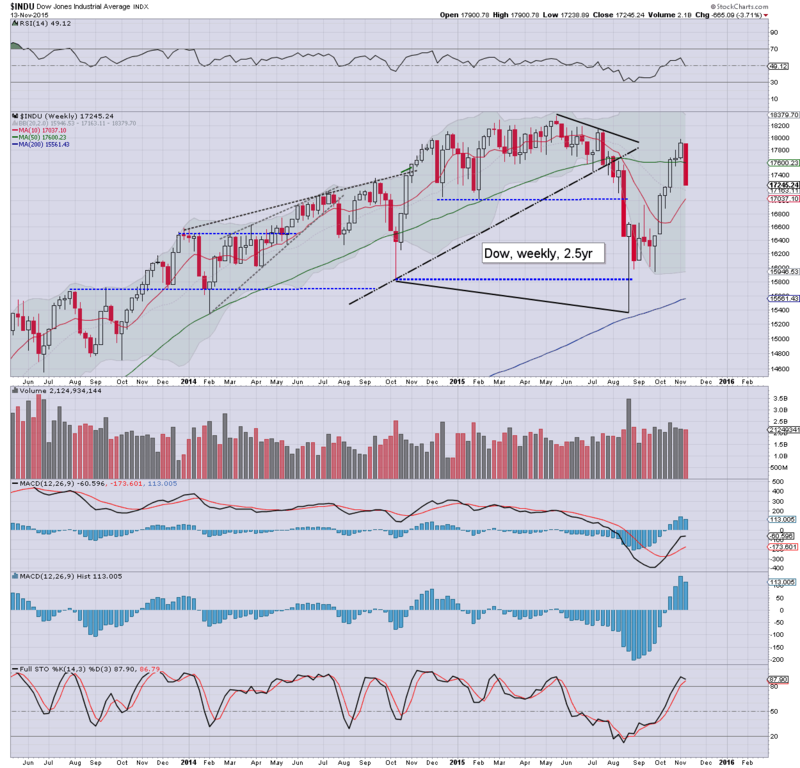 *a notable second consecutive red candle on the weekly chart. Despite prices collapsing since summer 2014 (ohh how high the $107s now seem! ), supply remains too high. Yes, there are aspects of weakness in the global economy, but I shall continue to strongly argue the problem is one of supply, NOT demand. 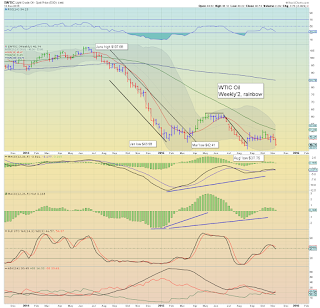 There has been very little capitulation within the Oil/gas sector. Until we see a few of the mid-size names disappear.. with supply eventually reducing... prices are going to remain under downward pressure. 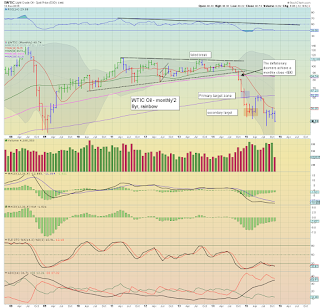 So.. the current cycle... 4 days down.. then a bear flag... with another 3 days lower. Best guess.. market is very close to flooring... before resuming higher into mid December.